Why Starbucks, McDonald's, and Microsoft stocks could make big moves over the next few trading days. 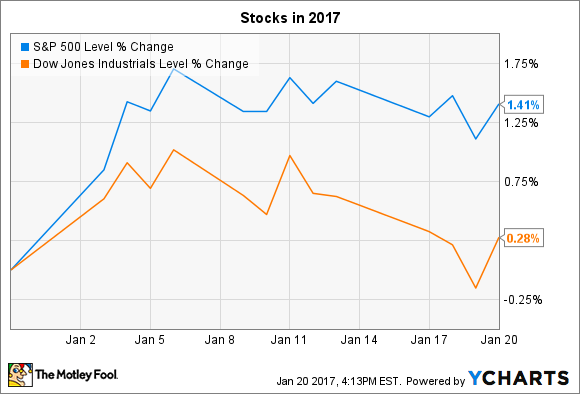 Stocks ticked lower last week, but remain up slightly through the first few weeks of 2017. The Dow Jones Industrial Average (DJINDICES:^DJI) and the S&P 500 (SNPINDEX:^GSPC) each remain near all-time highs as investors brace for an avalanche of quarterly earnings reports over the coming weeks. Hundreds of companies are set to post results for the final quarter of 2016 this week. A few of the most anticipated reports include Starbucks (NASDAQ:SBUX), McDonald's (NYSE:MCD) and Microsoft (NASDAQ:MSFT). Fast-food giant McDonald's starts the week off for investors with fourth-quarter results due out on Monday morning. After a disappointing two-year stretch, the restaurant chain is on a winning streak of five straight quarters of comparable-store sales growth, including a 6% spike early in 2016. The company's latest report wasn't as impressive, but global comps still accelerated to a 3.5% pace from the prior quarter's 3.1% uptick due to continued help from its all-day breakfast shift and a popular McPick 2 value platform. Growth might be harder to come by this quarter given the overall weak selling environment in the fast-food industry. Shareholders will likely hear updated thinking from management on industry trends and how they plan to keep improving the guest experience through menu additions and store remodels. On the financial side, McDonald's will complete most of its refranchising plan in 2017, which should raise significant funds for reinvesting in the business and returning cash to shareholders through dividends and stock buybacks. Starbucks kicks off its 2017 fiscal year with results due out after the market closes on Thursday. The coffee titan has seen its traffic gains slow recently, with transactions rising 2% in the past year following a 3% bump in the prior period. Beverage innovations and increased food sales helped average customer spending jump higher. However, the traffic decline muted overall gains. The coffee chain will need steady transaction growth to hit its long-term expansion plans. Executives believe they can boost earnings by between 15% and 20% each year through 2021 as Starbucks adds 12,000 stores to its base and increases sales at existing locations by about 5% annually. "I have never been more energized or optimistic about the opportunities ahead," CEO Howard Shultz said in early December as he discussed handing over his leadership role to Chief Operating Officer Kevin Johnson. Investors will be looking for evidence this week that these ambitious targets are achievable through initiatives like mobile ordering, global expansion, and a deeper push into the retailing world . Microsoft is coming off a strong 2016 that saw the stock finally surpass the all-time high it posted during the dot-com bubble era in late 1999. Investors sent shares higher, thanks to the success of its cloud business, which has been helped along by a doubling of Azure revenue. In Mr. Softy's most-recent quarter, growth in that segment helped offset a decline in the company's personal computing (PC) division, which was driven by continued weakness in the PC market. Consensus estimates call for a 2% sales decline and flat earnings when Microsoft posts results on Thursday. CEO Satya Nadella is likely to focus his management comments on high-growth cloud services, including an Azure offering that the company aims to grow into a $20 billion business by fiscal 2018. "The cloud is winning significant customer support," Nadella said following Microsoft's blockbuster July quarterly report. The key question for the company going forward is whether those growth engines will ramp up quickly enough to offset declines in legacy business like PC software and video gaming.